For our blog this week we have a review of the recent Moscow marathon from our expert triathlete from the other side of the globe TC Tanakorn. Check out his other content where he shares his wisdom and experience from a packed year of racing. After CIMB triathlon which turned into a swim-run (Aquathlon) race because of the heavy rain on race day. Me and my coach agreed to do a marathon training and preparation for Moscow marathon in only 6-7 weeks time. It was quite a difficult time for me changing from multi-sports training; swim, bike and run to single sport training. Long run with a single pace was probably always the most difficult session. Also, marathon training in Bangkok in rainy season is definitely not a good time of the year. 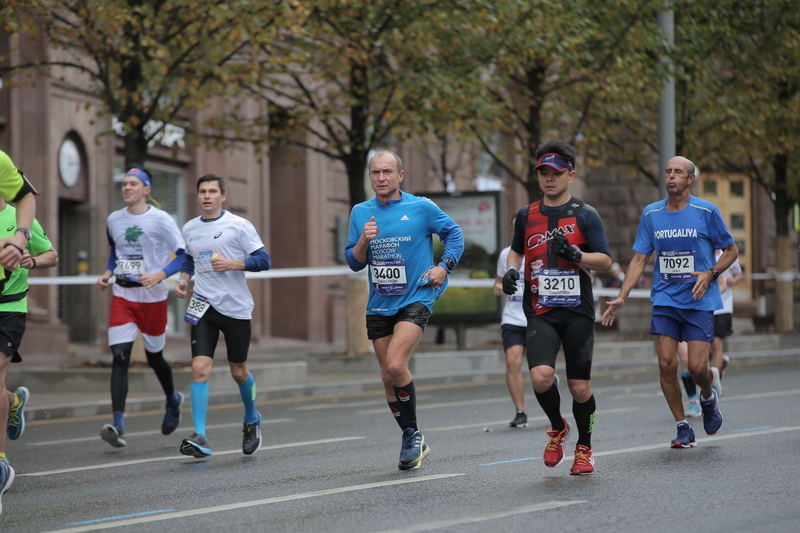 However, me and my coach, we have a common goal to achieve and that is to finish Moscow Marathon in 3:45 hours (5:19 minutes per kilometre in average pace). It might sound impossible for an average runner like me which had personal best time of 3:53 hours but I was willing to try my best to achieve this goal. During race week, I tried to rest and eat well as my coach recommended. It was quite strange despite of my struggling moments during marathon preparation. I still really look forward to run on Sunday September 23rd and I felt like my body was super ready to perform what I have been training for. To be honest, I had never felt this way for such a long time. I started the day with some carbohydrates ; few pieces of toast, pancake and waffle with honey and black coffee. It was raining during race day morning for the whole time and temperature was dropped to under 10c. The wind had started to pick up some pace and become quite strong on the first hour. I ran around 5:10-5:15 min/km pace for the whole 21km and my both legs still felt great. I felt that my heart rate started to increase once I passed 25km. When I reach 30km I could felt my left hamstring was going to cramp so I really have to slow down a bit and took extra gel before it got worse. During Km 30-35, with the combinations of rolling course and my tired legs. I really cannot hold 5:20 min/km.When the course took me along the river again on KM 36. The best pace I could possibly hold is around 6-7 min/km pace. The last few kilometers was quite a struggling moment and my legs had zero power left. On the last stretch to finish line, it was quite a difficult moment as everything in my body was about to shut down but the clock was ticking to 4 hours. So I gathered all my last drop of energy and finished within 4 hours. Although I could not achieve my personal best time at this race. I was glad that I could finish it under 4 hours. I really believe that 30km, 35km and more 3 hours long run are what I really need to achieve a sub 3:45 hours marathon time. Forget what you had been told about Russia, whether about the local people or the difficulty of commute through city. 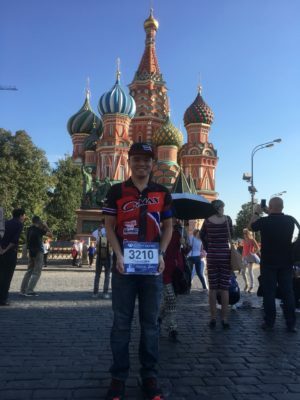 During my stay in Moscow, I was greeted by local people every time I went out for a morning run or wore an event official T-shirt. Moscow people love to have you and welcome you in the city and the most important is they would like you to have a great time during your race week. All the whole roads of 42 km race course were closed 100% for runners. Security and military officers can be seen every 300-500 meters for the whole race course. There are 13 water stations along the full marathon course. Bananas were provided after 10 km. Energy gels and drinks were provided after 25 km. All in all, if you are looking for a great marathon event in the city which have numerous of beautiful city’s landmarks along the course and provide superb safety for runners and spectators. Moscow marathon is the race you cannot be missed.